Today I participated in a panel debate at the Manning Centre’s annual conference. It’s a big conflab that attracts a whose who list of the Conservative Party and party faithful. The question we debated was, “Is it time to pull the plug on the CBC?” I debated the question with James Baxter from iPolitics and Brian Lilley, a co-founder of Rebel Media and all about town commentator for various conservative-type talk shows, publications, etc. So, should we pull the plug on the CBC? I said no! What follows is a slightly tidied up copy of my talking notes. However, I also wonder if focusing on the CBC is like looking at things through the wrong end of the telescope? Broadband internet and mobile wireless are now central to our whole way of life, economy and society, including the media, the CBC and journalism. We can no longer talk about the CBC, journalism or ‘the media’ without talking about internet & mobile phones. Mobile phone rates, data caps, broadband access, fibre-to-the-doorstep, and common carriage are as important as the CBC to most CDNs – in personal terms (intimacy @ a distance), social terms (access to knowledge, entertainment, opportunities, others), and $ terms (CDNs spend $5 on bandwidth for every $1 on media content). I leaned on two main sources for my talk: Noam (2016). Who Owns the World’s Media. New York: Oxford University Press and, of course, the data sets and reports from the Canadian Media Concentration Research Project that I direct. It has shrunk greatly over time against the backdrop of a vastly larger media landscape, as Figure 1 below illustrates. Source: Canadian Media Concentration Research Project (2016). Wholly new media have been added to the media universe: e.g. mobile phones, broadband internet access, pay TV, OTT, online gaming, social media, search engines, the hosting, buying and selling of stuff – ebay, Amazon, kijijji. The Canadian media economy has not only become much bigger and more complex but also become more concentrated since the turn-of-the-21st Century (although with important exceptions, such as, and crucially, internet news sources, radio and magazines). 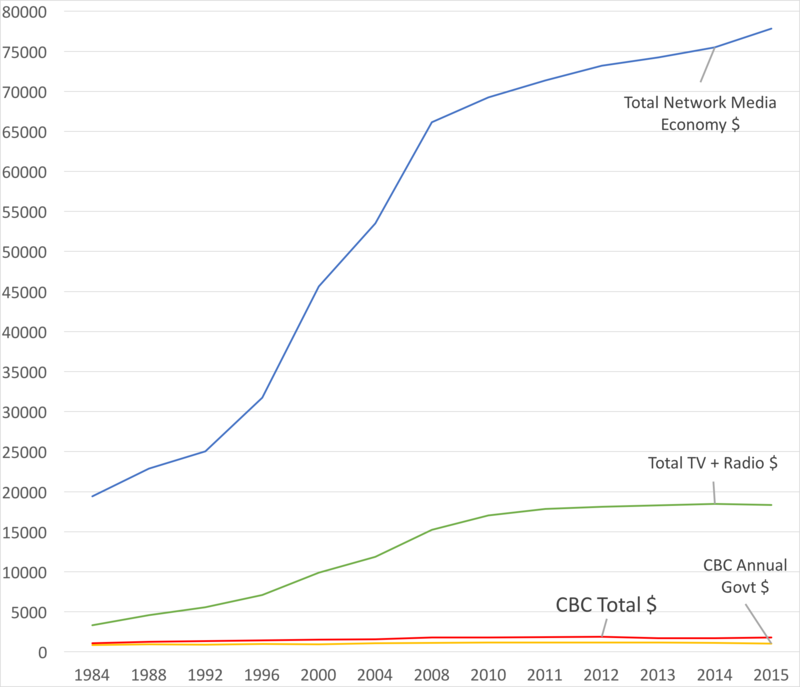 Among other things, Figure 2 below shows how the CBC’s place within the Canadian media economy shrunk between 1992 and 2015. The CBC is now a pygmy amongst giants. It’s share of the total media economy dropped from 5% in 1980s and early 1990s to less than half that amount today. Based on revenues in Canada, Google is now bigger than the CBC, while Facebook is about half its size. What also stands out is the extent to which a handful of companies stand at the apex of the internet and media landscape: Bell, Rogers, Telus, Shaw, Quebecor. Bell dominates with nearly 30% of all revenue, while the big five account for just under three-quarters of all revenue; that figure was 64% in 2000 and 60% in 1996. High levels of media concentration are not unusual, however. Summarizing the results of a thirty-country study, Eli Noam observes that media concentration is often “astonishingly high” around the world. Canada is no exception. Signing up for mobile wireless and broadband internet services in Canada is very expensive relative to the forty countries that make up the EU and OECD, as is the price of data. Data caps are also used widely and set at low levels after which punishing ‘overage charges’ kick in – as if we are using ‘too much internet’. Regulatory capture – governments have been unwilling to steal their spine to deal with such realities. The revolving door between industry and government does not help. The Harper Government went part way down the path needed to bring about more competition but the Liberal’s approval of Bell’s takeover of MTS last week effectively throws the last government’s pro-telecoms competition policy under the bus. CPC leadership candidate Maxime Bernier probably knows this file best amongst all of the party’s leadership candidates, but his plans are uninspired and too closely linked to those of the telcos. Instead of railing against the CBC, these kinds of issues should be higher up on our list of priorities. The industrial media age of the 19th and 20th centuries is giving way to the internet-based society of the 21st Century. The choices we make now will shape what happens for decades, and perhaps longer. We need to get this right. Funding levels for the CBC are low by international standards – less than half the average and about a sixth of the high-end of the scale. The figure below illustrates funding levels per person in Canada versus other OECD countries, using 2014 data from all of the other countries but 2016 data for Canada to capture the increased funding put into the CBC by the Trudeau Government. Source: Nordicity (2016). Analysis of Government Support for Public Broadcasting. London, UK & Ottawa: Nordicity. 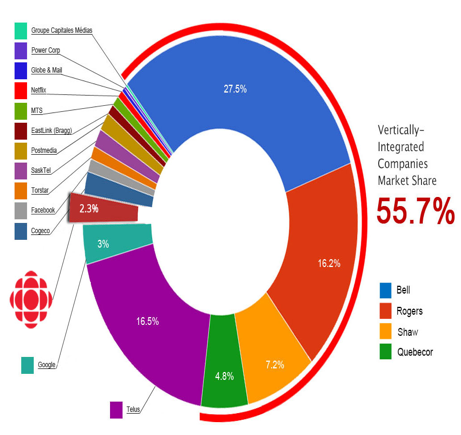 As a recent article by DeCillia and McCurdy shows, the 467 instances of media coverage of the CBC that they examined between 2009 and 2014 highlights the extent to which the CBC faces an overwhelmingly hostile press that typically casts it as threat to commercial interests rather than taking up its place within a democratic society. Investment in original journalism and Canadian content. While the CBC accounts for just a fifth of all TV and radio revenue, it is accounts for a third of investment in original TV/radio journalism, news and information programs and a quarter of all spending on TV and radio content production in Canada. It also maintains 9 foreign news bureaus while the private sector has cut to a bare minimum. The CBC TV audience has declined but still garners 10% audience share and is still a significant TV news source (8% in English regions, 18% in QC). The CBC has been an early adopter of digital technologies, the internet and mobile apps. Well before 2008, the CBC was making its archive of programs, streaming services, TV episodes, print and audiovisual news and commentary available via its website, apps, and on iTunes, YouTube, etc. – all for $33 a year (3rd lowest amongst 18 comparable OECD countries) (Nordicity, 2016, p. 44). The commercial companies did not start in earnest until 2010, but they are still dragging their feet to this day. 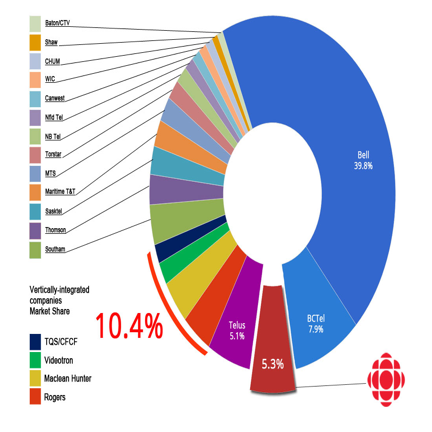 The results show — the CBC is the #1 source of online news for Canadians, as the Figure below illustrates. Source: ComScore Long Term Trend, September 2012 — September 2015, Total Canada, News and Information Category. While the CBC is the number 1 internet news source in Canada, it is crucial to stress that it does not dominate the internet news environment. People get their news from many internet news sources — old (e.g. CBC, Postmedia, Toronto Star, CTV) and new (e.g. iPolitics, Huffington Post, Buzzfeed), domestic and foreign (e.g. BBC, Yahoo!-ABC, the Guardian, New York Times). Most news organizations are short on money, trust and full-time journalists. New internet news ventures like iPolitics are groping their way to survival. The “crisis of journalism” is real, as the Public Policy Forum’s recent report The Shattered Mirror: News, Trust and Democracy states – but not of the magnitude or for the reasons it suggests. Against the backdrop of a heightened state of flux, the CBC offers a steady, reliable and well-trusted source of news. New online journalistic ventures like iPolitics, Canadaland, The Tyee, Ricochet Media, etc. 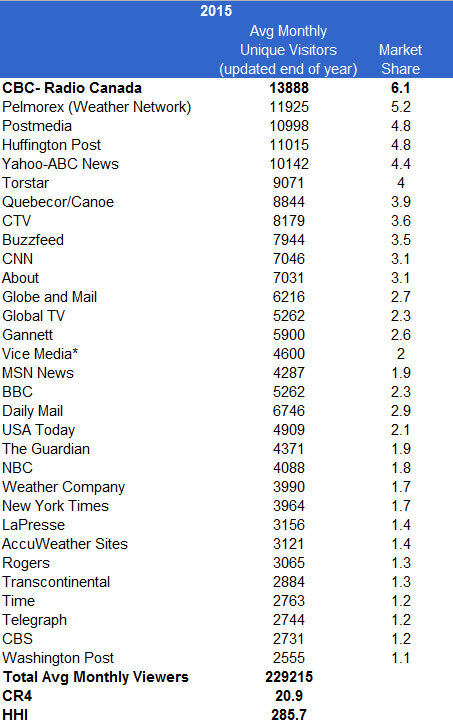 are important to their own niche audiences, but none of them crack the top 60 most popular internet news sources. While trust in traditional media is weak and declining it is lower yet for ‘internet-based’ media (sometimes undeservedly so). In contrast, a large majority of Canadians — 75-80% — trust the CBC. As such, it helps fill the ‘trust gap’ and since democracy rests on trust, we can say that the CBC’s makes a positive contribution to democracy. The economic base of the media no longer depends on advertising revenue but subscription fees: broadband internet, mobile phones, cable TV, Netflix, Spotify, etc. Subscription revenue now outstrips advertising revenue by a 5:1 ratio. Advertising spending has flat-lined since 2008 and fallen on a per capita basis in the last three years This is not because of the rise of the internet, Google and Facebook but the sluggish economy. What’s left is increasingly going to the internet. Google and Facebook, in turn, dominate internet advertising not because they are vampire squids sucking the lifeblood out of journalism and ‘old’ media but because they are better at doing what the mass media used to do best: delivering audiences to advertisers. 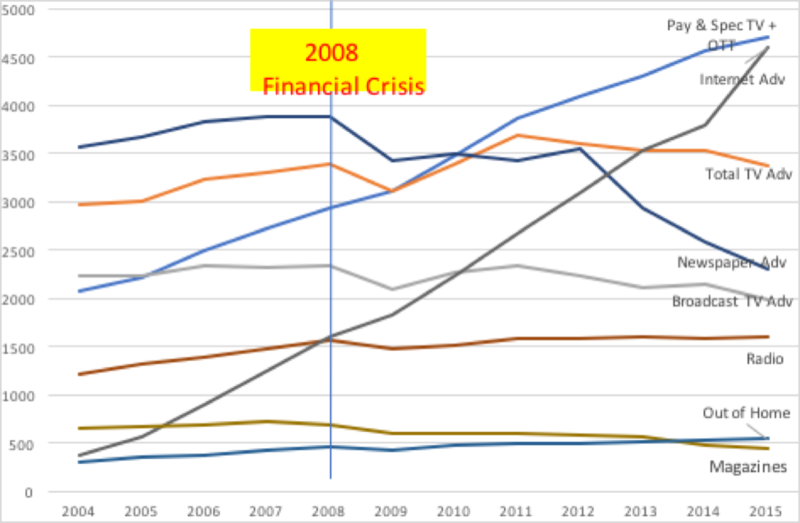 Figure 5 shows how advertising revenue tumbled for most media after 2008, and even slowed for internet advertising. Source: Canadian Media Concentration Research Project. Advertising-funded mass media are in trouble not because of the CBC, but because (a) total advertising $ are stagnating or in decline; (b) pay-per media are expanding; and (c) the internet is better at delivering audiences to advertisers. The general public has never paid the full cost of general news services, and likely never will. Consequently, journalism and ‘general media services’ have always been subsidized by either advertising, wealthy patrons, propaganda in authoritarian regimes or the public purse in democratic countries. Given this baseline reality (i.e. unwillingness to pay), the market does not and cannot fully support the kinds of general journalism and media services that Canadians want and democracy needs. This is not to denigrate the market, but recognize its limits. Filling in the gap between what the market offers and what people want and democracy needs is the raison d’être of the CBC. As the bottom of the advertising subsidy falls out from under some media and journalism, what kind of subsidy will rush in to fill the void: (1) rich sponsors; (2) propaganda; or (3) the public purse? My vote is for the CBC. dial-down the anti-CBC hyperbole in the press and some political quarters. Valuing journalism and quality media is not a zero-sum game but a virtuous circle that benefits all: strong spending on PSM occurs alongside greater personal willingness to pay for news (Norway, Sweden, Denmark, Finland & the Netherlands), and is positively tied to very high rankings on free press indexes and strong democracies. telco-ISPs are pushing hard to become gatekeepers (publishers) in relation to the open internet rather than gateways (common carriers). will help to decrease the problem of regulatory capture stop the spinning revolving door between industry and government – regardless of who or which party is in power.